While sleeping the throat muscles relax, the tongue falls backwards, and the throat becomes narrow and ‘floppy’, and as you breathe, the throat walls begin to vibrate that leads to the characteristic sound of snoring. 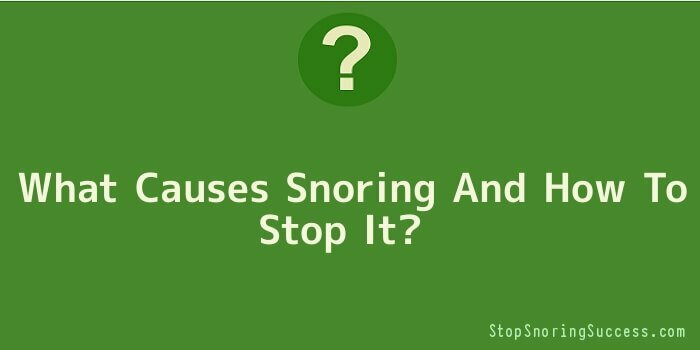 Snoring can occur intermittently or nightly and becomes more serious as people age. Males are generally more at risk, especially those that are overweight, though it is a problem of both genders. Snoring can cause disruptions to you and your partners sleep, leading to fragmented and un-refreshing sleep that translates into poor daytime functioning. How to stop snoring naturally is a question most snorers would like to have answer to, thus mentioned below are the causes and ways to stop snoring. 1. Overuse of nasal sprays. 3. Different kinds of allergies can clog the trachea and airway. 5. Excessive weight gain and obesity caused an enlarged neck and excess soft tissue in the trachea. 6. Thickened tissues resulting from some surgeries unrelated to snoring, in the nasal passage. 7. Any medication leading to excessive relaxation. 8. Other habits like drinking alcohol and smoking. 9. Loss of muscle tone in the neck due to the normal aging process. 10. Heredity factors that are beyond our control like a cleft palate and a narrow throat. 11. Sleeping flat on your back that allows the flesh of your throat to relax and block the airway. People seeking answer to the question how to stop snoring naturally have solutions they can follow, though they range from the natural ones to the ones where you would need the help of a physician. Try to sleep on your side. Restrict the intake of medication and alcohol. Lose weight by eating the right kind of food. Use a pillow or elevate the head of your bed. Keep your nasal passage always clear. Try to use a CPAP (Continuous Positive Airway Pressure), oral devices, or dental appliances after consulting your doctor. Surgery is needed at times to increase the airway, by surgically removing tissues or correcting abnormalities. Try taking antihistamine or decongestants if nasal congestion occurs. Sleeping in separate bedrooms is not the answer to the snoring problems, and those wondering how to stop snoring naturally can choose any one of the above options or even try the alternative therapy options like magnetic therapy, naturopathic, Chinese medicine, homeopathic and other promising treatment options.